Here is the space where I mash together goodies that are both inspiring or just plain beautiful! Videos, images music, articles...you name it ! I hope they feed your creative mind, spark curiosity or in the very least make you smile. LOVING VINCENT, the world's first fully oil painted feature film, brings the artwork of Vincent van Gogh to life in an exploration of the complicated life and controversial death of one of history's most celebrated artists. More than six years in the making with the help of 125 specially trained painters. LOVING VINCENT is a uniquely animated film composed of 65,000 hand painted frames! The Magical Beauty of Mushrooms captured by Jill Bliss. View her GALLERY HERE! 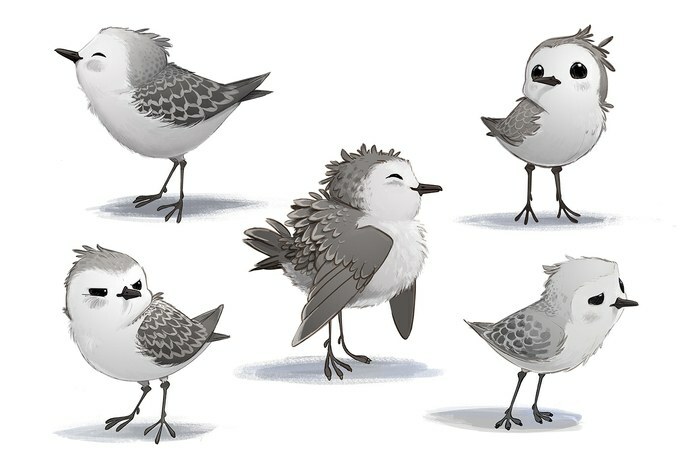 Piper, an adorable Pixar short tells the story of a young sandpiper who fears the sea so much that it makes finding food especially challenging. I love, love, love this short! I cannot say that enough. The pure simplicity in the story coupled with how Pixar pushes technological boundaries has made Piper a real gem. I've been in love with Andre Kohn's Paintings for YEARS. His style of artwork can be characterized under Russian Figurative Impressionist work. Do yourself a favour and go check out his WEBSITE! If this image doesnt spark the imagination then I don't know what will. This is an underwater waterfall just off the coast of Le Morne, Mauritius. Sand and silt on the ocean floor run off in a way that makes it look like they're pouring down a waterfall -- or like the entire island is being sucked down a vast drain. Find out more must sees in Mauritius HERE. And finally some inspiring music I found today. Enjoy!